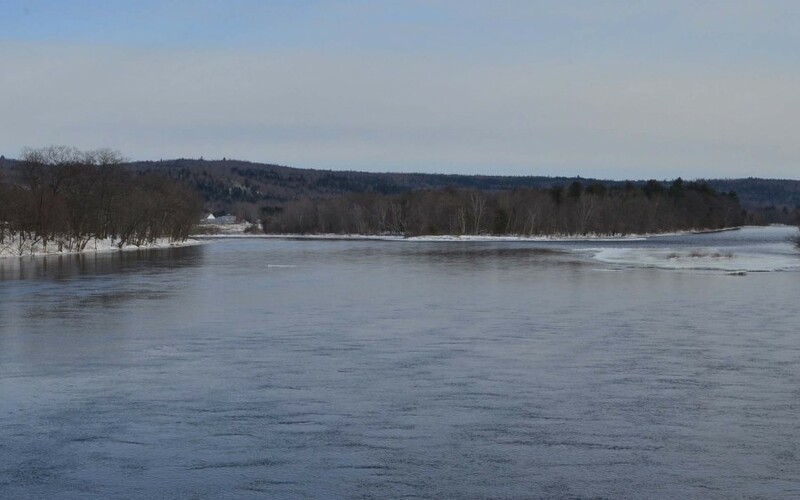 The 5.74+- acre lot is situated along Maine's Piscataquis River. This surveyed parcel has public road access and is just 5 minutes away from I-95, yet is quite private and quiet. 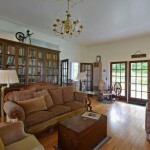 The property has 1200+- feet of river frontage and sits high on a bank overlooking the Piscataquis River. 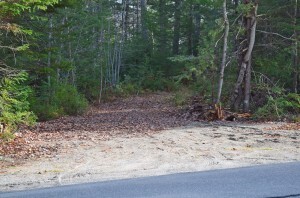 The lot has been soil tested and there is plenty of room to build a river front home or cottage. The lot is heavily treed with a mixed growth of softwood and hardwood species. 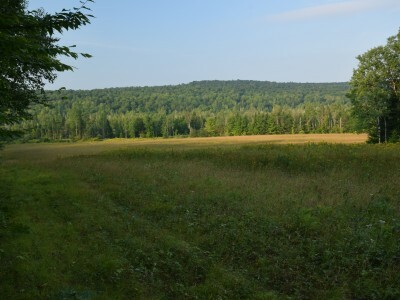 Tracks of deer, moose and other forest creatures have been seen on outings to the property. 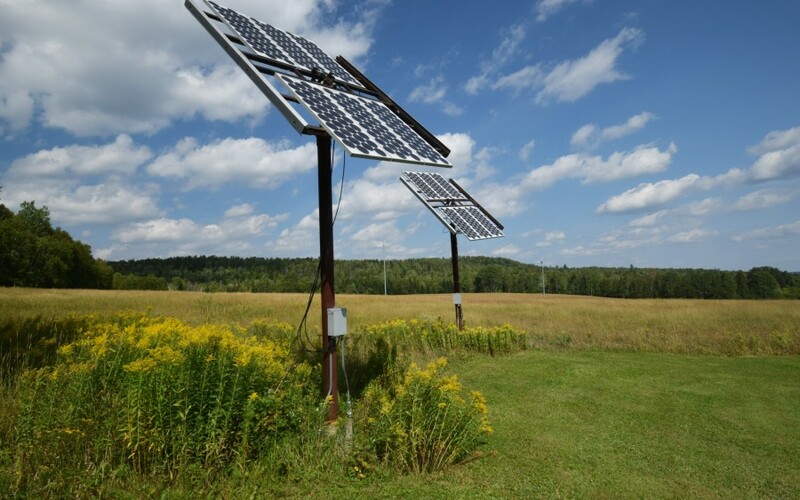 The lower portion of the property that extends to the river's edge benefits from heavy spring runoff which has deposited nutrient rich soil along the river's edge. This area in the month of May erupts in green growth of one of Maine's wild delicacies, the fiddlehead. This fern emerges as temperatures rise and waters recede and are a delicious and nutritious delicacy. The waters of the river are home to many fish species from brook trout to smallmouth bass. 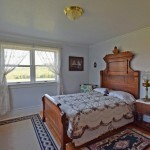 The property benefits from being located close to I-95 which makes it very accessible. It is just 30 minutes from Bangor, ME with its shopping opportunities, world class health care found at Eastern Maine Medical Center and a multitude of dining opportunities. Bangor International Airport makes travel to far off destinations convenient. Educational opportunities abound at The University of Maine located just 25 minutes away. 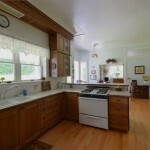 This property is waiting for you to make it your home. 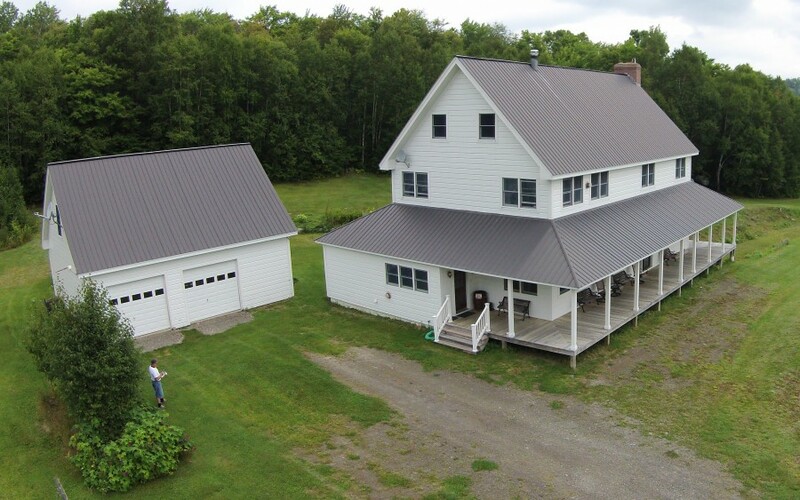 Convenient, quiet and pristine, the Piscataquis Overlook is available for you. 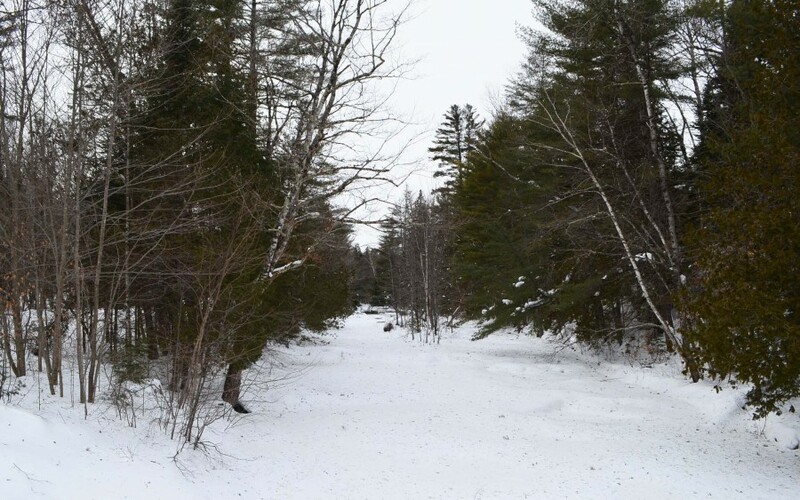 Call today and make this Piscataquis river front lot your new home. Overview - Cold Stream Pond is one of the finest lakes in central Maine. It is very scenic with views of Mount Katahdin to the north and the "Bluff", a large elevated peninsula that separates the southern and northern basins of the lake. This large lake which is partly located in the towns of Enfield, Lincoln and Lowell, is probably best known for its incredible water quality and clarity. The water quality is so good that the state of Maine established a fish hatchery in Enfield using the lakes water via a pipeline. 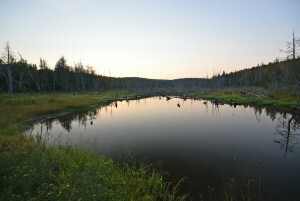 The lake is supplied water by springs and also fed by the outlet of the two Upper Cold Stream Ponds located in Lincoln. This outlet is Smelt Brook and enters Cold Stream Pond in the northern basin. A few other cold brooks enter the lake including Miles Brook and the outlet of nearby Trout Pond in Lowell. Size, Depths and Boating - The surface area of the lake is more than 3,600 acres. The upper basin is approximately 704 acres and max depth of 56 feet. The state lake survey says that the upper basin has good water quality but can suffer from lower dissolved oxygen levels in the later part of summer. This is a quiet place to explore large rocky coves with a kayak and is usually the first area of safe for ice fishing in the winter. The lower basin contains about 2,924 acres with water depths up to 104 feet. This is a deep round basin perfect for boating, water skiing and sailing. 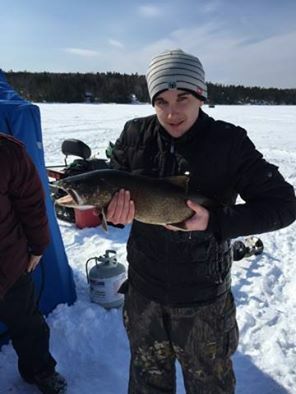 Ice fishing for Maine Lake Trout or "Togue"
Boat Landing and Beach Location - Cold Stream Pond has one improved boat landing located at the south west corner of the lake at its outlet. There is a concrete ramp and parking area located at the end of Old Hatchery Road near the center of Enfield. The ramp is located in the outlet and is sheltered from wind and weather. Large boats can be launched at this landing but use caution when exiting the channel of the stream as there are a few large rocks. There is a public beach located on the western shore known as Morgans Beach. It is a beautiful sand beach and an excellent place for swimming and a family picnic. Traveling north on the Lincoln Road from Enfield village look for the signs for the beach on the right. Real Estate Types & Values - Property types around Cold Stream Pond include small seasonal cottages and cabins which are mostly on the west shore of the lake. This was the area first developed nearly 100 years ago. Some of these properties have since been converted to year round homes. Finding land for building is rare on this side of the lake. Cottages will range in value from $125,000 to $250,000 depending on lot size, building and lake front quality among other variables. Year round converted properties will sell from $200,000 - $300,000 on average. The eastern side of the pond was not developed until the late 1980's. Lots on this side of the lake are much larger because of changes in zoning regulations and required setbacks that went from 75 to 100 feet in residential zones and 250 foot lake setbacks in the resource protected areas of Enfield and Lowell. Most of the properties found on this side of the lake are much newer and larger than the west side. 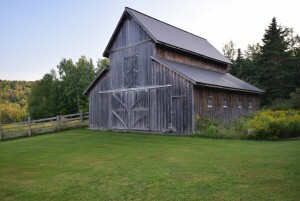 Most are year round residences. Property values on this side of the lake currently range from $250,000 to over $400,000. Getting Here - From I-95 you take exit 217 and head east on Route 155 about 6 miles to the boat landing on Old Hatchery Road. 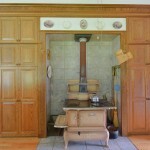 The landing is located 39 miles from Bangor, Maine and 272 miles from Boston, Ma. If you are looking for a perfect central Maine waterfront property see our listings linked CLICK HERE FOR MAINE WATERFRONT PROPERTIES.